Jemelia and her brand new book. “This place is full of magic,” said nine-year-old Jamelia as she stepped on the bus. The ceiling was painted in Starry Night swirls and the shelves were stocked with books, thousands of books. A smile stretched across her face as she imagined the possibilities. The 2011 Transitions/VSP Success is in Sight Tour traveled to Harlem to be part of the Harlem Children’s Festival. Bess was joined by Eyenstein, the mobile vision clinic from Transitions and VSP in an effort to prepare kids for success in the classroom. While Bess the Book Bus gave away thousands of new books, the Transitions/VSP team gave our kids the gift of healthy sight by providing free eye exams and new glasses. Harlem Children’s Festival is part of Harlem Week, a summer long celebration of community achievement. A marching band paraded down 135th street to open the event and then thousands of people followed. Local artists and musicians stretched city streets in between tables of hand-crafted jewelry and home cooked food. Pushcarts of Italian Ice weaved through the crowd in search of children with melting face paint. The scene stretched throughout the long city blocks. Bess and Eyenstein parked amidst it all, between the WHCR live broadcast and the talent show stage. Despite the wall of sound, lines formed as word spread about the free books. Retired teachers told parents. Teens told their friends. Kids grabbed their cousins and neighbors. From the Bluford series to Handy Manny, there was something on board for everyone. Even adults came aboard to ask if we had any books for them. Sometimes they said it with a laugh, sometimes with a whisper. A father approached the bus with his three children and enthusiastically helped them pick out books. While they were sifting through the shelves, he stopped Jennifer and asked a question so quietly that it begged repeating. This question has been common across the country, but it’s still shocking to hear. It takes courage to start that conversation, especially with a stranger. But the answer is always simple. “Yes. We do. You are already doing it”. Bring as many books as possible into your home. Read to your children. Read every day. Read anything you can get your hands on. Ask your librarian for help looking up family literacy initiatives like the National Center for Family Literacy. Across the country, there are 93 million Americans who read below a fifth grade level. Adults living poverty are more likely to struggle with reading challenges. Those living in poverty also have less access to books. The answer to illiteracy isn’t magic. It is simple. Get more books into the homes of our families. Build home libraries and lifelong readers. Equal access to quality reading materials and other educational resources is critical to the success of this country. The good news? It is easy to do. 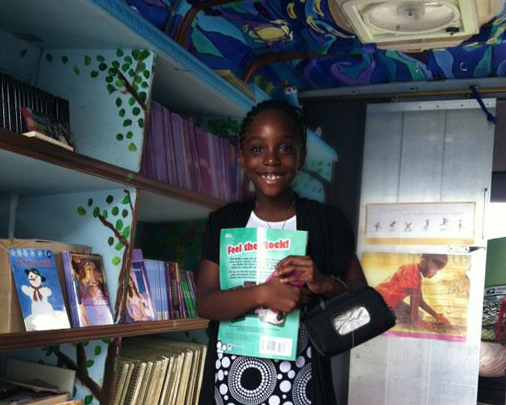 Every dollar donated to Bess the Bus provides up to three new books for our families, opening worlds of opportunity. Bess the Book Bus continues on to keep success in sight for children and families across the country. Follow on Facebook, Twitter and YouTube for more updates through the trip. Until next time, safe travels through the pages. Bess the Book Bus · Explore the World,Cover to Cover!